Traditional Chinese arts and crafts are being presented through a dance drama by the Beijing Dance Academy that is now touring Europe. Fen Mo (When Painting Comes Alive), the dance drama, is being staged in nine cities in five countries from Jan 17 at venues ranging from the National Theater of Novi Sad, Serbia, to the Palace of Arts (MUPA) of Budapest in Hungary. The dance drama premiered at the Tianqiao Theater in Beijing in 2009. It features 31 students from the Beijing dance school, all of whom major in traditional Chinese dance. The Europe tour ends on Tuesday. Consisting of five chapters, Fen Mo has borrowed elements from traditional Chinese culture, such as Peking Opera, ink painting, paper art and tai chi, to display the beauty of Chinese paintings in particular. 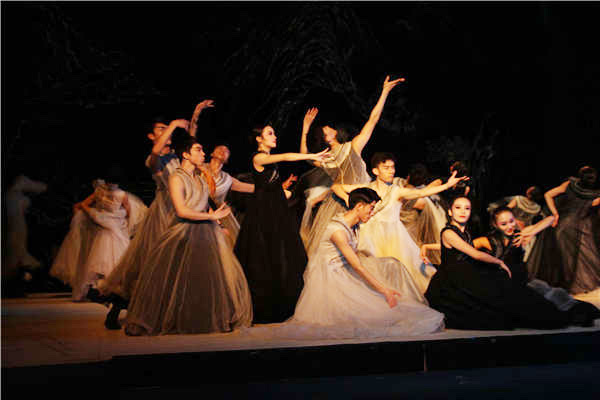 So far, the dance drama has attracted more than 5,000 audience members during its ongoing tour. According to Pang Dan, director of the traditional Chinese dance department at the Beijing Dance Academy, the tour is the school's first such large-scale presentation in Europe. "We are trying to break with conventional storytelling in dance dramas. With Fen Mo, we use symbols that represent traditional Chinese culture to communicate with the audience," says Pang, who is also one of the choreographers of the dance drama. Fen Mo was revised in 2016 to celebrate the 55th anniversary of the founding of the dance school. Pang says traditional Chinese dance was set up as a subject to research and teach at the school more than 60 years ago. The evolution of traditional Chinese dance has been a major subject there. Fen Mo was born as an attempt to show its direction. Dong Jiaming performs one of the five chapters, titled Dan. In the chapter, he finishes a pas de deux with a female dancer, portraying a rain scene with paper umbrellas. "Chinese elements are displayed in the dance in an abstract way. We use our movements, especially our breathing, to showcase traditional Chinese painting, which is poetic and rhythmical," says Dong. The 21-year-old will graduate from the Beijing Dance Academy this summer. He was born and grew up in Jiaozuo, Henan province, and was enrolled in the affiliated school of the Beijing Dance Academy at 11 years old. The European tour of the dance drama is part of the official Happy Chinese New Year program. Organized by the Ministry of Culture in 2010, the program covers about 400 cities in 130 countries. Spring Festival, which is celebrated as China's biggest annual holiday, is being embraced by more countries as an occasion to participate in festivities and as a way to experience Chinese culture in general.